Earlier this week I invited my team from work home for a Christmas lunch. As it is every year, cooking produce from the garden was the focus for the meal. It definitely proves the value of growing what you eat, with the freshness of the ingredients a big extra benefit. PS. sorry no photos — too busy cooking all day! This entry was posted in Uncategorized and tagged beetroot, carrots, christmas, Christmas lunch, green beans, mulberries, parsnip, summer. This super-simple no-knead bread was the star of the meal. With such a mild winter, it seemed like the perfect time to have friends around for Sunday lunch. Like all our meals for guests, we try to feature our locally grown produce as much as possible. Today it was a home-made ploughman’s lunch. We then followed that up with a steamed marmalade pudding, using home-made marmalade. The spread of food, laid out on the table, ready to eat! This entry was posted in Cooking, Growing our own food and tagged beetroot, bread, chutney, cucumbers, eggs, gherkins, ploughman s lunch, relish. Some weeks, it seems like the garden has a one track mind: all cabbage all the time, all silverbeet, all snowpeas. So it’s nice to be able to pull a mix of things out of the garden, and to cook them all for dinner an hour later. In this case, we harvested three stalks of rhubarb, a white beetroot and handful of new potatoes (ranging from tiny to full-sized). This entry was posted in Growing our own food and tagged beetroot, potatoes, rhubarb. Over the past few months I’ve been growing beetroot in the herb garden. It has taken a while because the first time I planted them, I didn’t realise there were 2-3 plants clumped together in each mini-punnet which hindered their growth. When I realised, I then separated them out so they each had space to expand. The label said these were baby beets, but as you can see from the photo below, they grow large if you allow them to! Four beets made three jars of beetroot, which is tastier than the tinned supermarket variety. The beetroot leaves taste similar to spinach so we’ll be eating that later in the week. 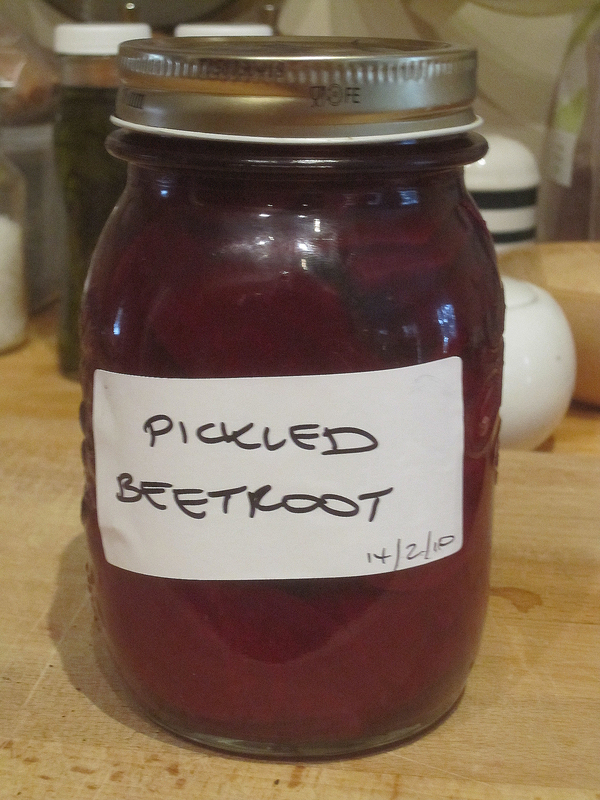 This entry was posted in Growing our own food and tagged beetroot, pickle.